All the Daily Image mailings for the month of March 2011. 01 Mar 11 From both my years of flying as an Aerospace Physiologist while on active duty, and having grown up in a Boeing Aircraft family, I find it impossible to not make comparisons between the marvelous creation for flight seen in birds and the crude but fully functional approximations in our aircraft. While I was watching these Snow Geese land on Friday last I couldn't help but make the comparison of the wing tip feathers on the geese and trim tabs on the wing of a plane. Having watched many raptors from above, it always amazes me how simply tweaking those distal feathers allows them to make some very subtle adjustments in their flight. I have no doubt that the same is occurring in the landing of the geese as captured in this image, however it wasn't quite so obvious, likely because of the difference in timing; soaring in the case of the raptors and near "crash" landing with the geese. I also wanted to make a comparison with the elevated feathers in the backs of the geese and speed brakes in modern aircraft, but I think that is more likely wishful conjecturing than actuality. 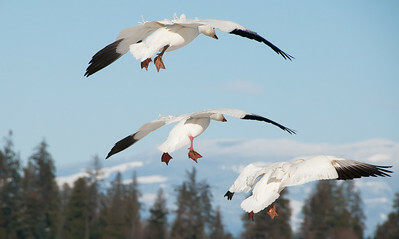 Nonetheless, it is fun to watch these beautiful birds both in flight and as the transition to and from it. ISO 200; 1/1600 sec @ f / 9. 02 Mar 11 Waiting for some flight action while standing on the side of the road, I noticed that a few of the geese were approaching a spot near me where there was a very slight mounding of the farmland. Apparently it was providing sufficient warmth for some of the standing ice to melt and offer a very small watering hole. As one looked out over the fields it was very much the case of "water, water every where and not a drop to drink", (apologies to Coleridge) except for this one small location. I watched this one animal taking sips for a period of perhaps 10 minutes, occasionally raising its head into the sunlight, such that it looked as though it had spent some time in a dental chair having a few gold crowns installed. Sorta reminded me of that villain of villains in Goldfinger, Odd Job, played by Harold Sakata. 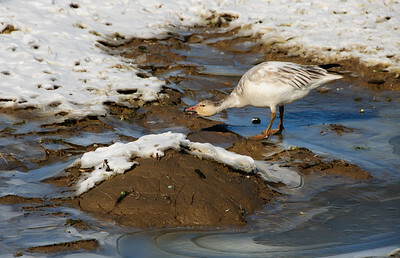 The goose however was just there getting a drink. While this individual was drinking no one else approached, but once finished and departed, several more all came at once to get a sip. Referencing back to yesterday's comments on the uplifted feathers on the three geese, it was suggested by a former Naval Aviator that in fact those feathers may be serving the function of spoilers, allowing for the geese to make a steeper angle of descent while landing. ISO 200; 1/1250 sec @ f / 9. 03 Mar 11. 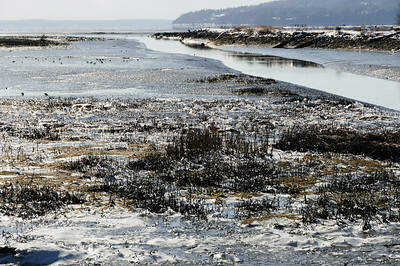 Most of the photographers that I know who travel to Fir Island are generally interested in either raptors or water fowl. The majority of what I have shared over the last four years has been either Snow Geese (Chen caerulescens) or Great Blue Herons (Ardea herodias) with a smattering of raptors, with by far the majority being geese images. 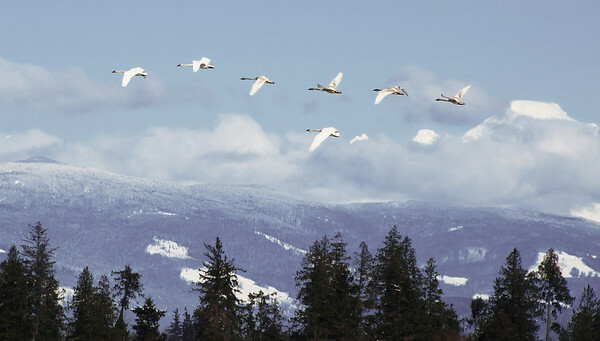 There is another goodly sized gathering of birds there, although nowhere near the size of the geese in number, which are Trumpeter Swans (Cygnus buccinator), an absolutely beautiful bird! I've been kinda close to a group of 3 while we were in Yellowstone in 2007, but never really close enough to show off their beauty. At Fir Island I've never even seen one up close on the ground or water's surface, but have on several occasions seen them in the fields sufficiently distant to be white blotches on a green or brown surface. So getting a good Trumpeter image has eluded me for the most part. However, they tend to fly overhead or at a distance somewhat frequently, and last Friday there were several flights of 2 -7 that passed overhead. I tried to capture several of the flights, but with a 300 mm equivalent lens (the 18-200 equates to a 27 - 300 for a film camera or full frame censor) the birds were, for the most part, not a significant part of the image. But I've selected one for today's submission in which I've severely cropped away all but the most important parts (mountain & birds) to give you an idea of just how elegant these birds are in flight. They will be in the area for a few more weeks so for those of you in the greater PNW's western side there is still time to go up into the Skagit Valley to observe them. I feel confident you will delight in what you see. If these birds, or distant cousins, live in your area, I would encourage you to go out and let them bring some true beauty into your lives. I would have preferred better lighting, definitely less blue, for showing off the birds, but the window incident precluded my staying late enough to get same, so we'll go with what I got. ISO 200; 1/1000 sec @ f / 11. 04 Mar 11. This basic shot has been shared with you at least 5 times in the last two years, but each one has been significantly different form the other. The trip last Friday to Fir Island was the only time I've ever seen the area covered in snow, and the first time I've seen what is effectively a tidal flat snowed over. I had just walked back from shooting the geese the game department individual didn't like me doing, and in preparation for an afternoon shoot that didn't occur due to the window problem, took a short walk (perhaps 100 feet) to the top of the dike isolating the farm lands to the north - obviously former tide lands - from the remaining existing tide lands. As I walked up the dike I encountered the stickiest mug I've ever walked in and couldn't help but think it would make for some good pottery. Now I know nothing about pottery, but anything that sticky, when dried, probably wouldn't even need to be fired, it would just stick together! Along with anything in it, like my feet!! It was even slippery than it was sticky, so I took just a couple of shots for the moment, hoping it would become a bit more solid as evening approached, at which time I would come back and work the shoreline for a period of time. That of course didn't happen, so I'm sharing one of the two I did get, and one which I find reasonably interesting. The clear bright blue sky was giving the entire scene an oddly blue hue which, to my way of thinking, just made the entire area look cold. It was actually 26°F so it really didn't need that much help to be convincing; the blue color simply made the location look as though it was something out of the last ice age when glacier movement cut out Puget Sound. ISO 200; 1/1000 sec @ f / 9. 07 Mar 11. 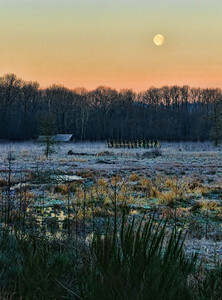 Arriving at moondown (like sundown but dealing with the moon) at the Nisqually National Wildlife Refuge I got to watch the scenery change from the very early morning cool pastel colors to the fleeting vibrant ones as the sun crested the cascade range and began to strike the surrounding vegetation. This grouping of hardwoods at waters edge put on a constantly changing show for about 5 minutes, and this image represents what was there at the point of greatest color. It reminded me of parts of Colorado when the aspens change their color and the east coast in general during fall. These trees however were leafless, and the color is just the sun reflecting off the bark. In the patches where the skim ice has melted you can see the color reflected. Where it isn't melted you get the blue of the sky. A bit colder than it was for Friday's image, but only by a couple of degrees. Not quite a shot from the golden hour of time but close enough to cause one to get out early and brave the elements. ISO 320; 1/320 sec @ f / 6.3. 08 Mar 11. If you are anything like me, I'll wager that all too often there is surrounding beauty that goes unnoticed if not forever, at least until it is pointed out to us by someone or something else. My grandfather raised a few cows, my cousin raises cows, and we have been around cows at some time or another all our lives. 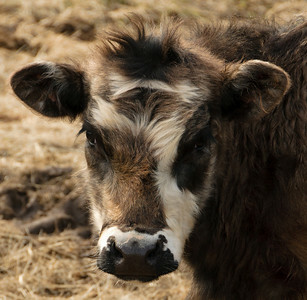 But then, other than drooling, smelly, and messy critters they are just cattle. Or so it may seem unless you happen to have grown up 4-H or have a camera. Case in point is today's portrait. After having worked on the property for a few hours Sunday afternoon I gravitated to my cousin's farm to grab some firewood when his herd came up looking for a handout. Among them was Ten-ten, a 9 month old steer calf who happened to completely catch my eye although that was definitely not his intent. The late afternoon light was striking his coat and I was totally charmed by both its coloration and texture, so I started working with him to see what I could get. A couple of the photos of his coat turned out well as did a couple of his entirety from which I cropped out what you have for today. If you look closely you may get an appreciation for his coloration as well as for some of finer hairs on his head. Jan thought he would make a great pet, my cousin's wife as something that would look much better on a plate, and I could envision his head mounted on my wall, along with a pair of boots and a lariat. Not exactly similar perspectives, but all pertaining to Ten-ten. ISO 200; 1/200 sec @ f / 9. 09 Mar 11. 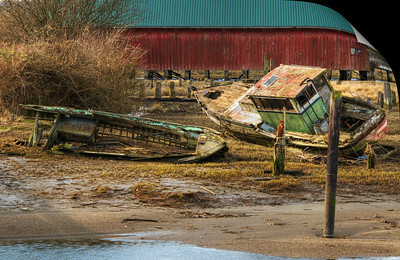 Not to far north of Fir Island, where I take the images of the geese, 15 - 30 minutes depending on how fast you drive and if you stop for some baked goodies, is found the Salish Slough, an area where the Salish River meets Puget Sound and where one can find a few rather bedraggled worn out vessels of yore. I have no way of knowing if these are just really very old wooden boats who have outlived their usefulness, or vessels not quite so old which have not been properly maintained. Regardless of how they got to the condition where they are today, they are total derelicts, but, residing where they do, make for interesting photographic subjects. Moreover, they make for wonderful HDR subjects, so we return to the HDR topic and this time I'm sharing a composite made from 5 images, each 1 stop apart; 2 under, 1 under, on target, 1 over, and 2 over, and created in software designed specifically for that purpose. You can compare this image with the three I shared earlier and decide what you like better. Turning the page just a little, the annual Mountaineer's Basic Photo course has begun and in a couple of weeks we will be shooting, as always, at the Fisherman's Terminal so I'll soon be sharing some images of vessels still floating and working to contrast with what you see today. ISO 200; 1/125 sec (for the on target shot - the range being 1/500, 1/250, 1/125, 1/60, 1/30) @ f /13. 10 Mar 11. 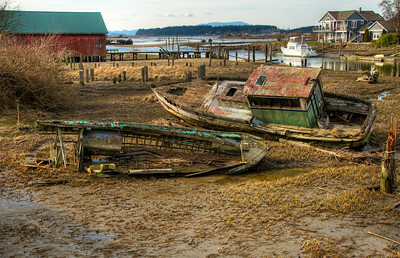 With the chance of being boring accepted, we return to the Salish Slough and another HDR photo. Today's image is almost the same as yesterday's, save for a few additional features. And a little more of the story if you will. Directly behind the red building, a former and now defunct cannery, you will find several very run down homes of what are apparently fishing families who have maintained all their occupational equipments and have them strewn just about everywhere around their properties, including signs that let you know in no uncertain terms that these homes are PRIVATE PROPERTY and that you are not welcome. Situated directly across from these properties you find total opulence in 7 figure properties. The two groups of properties each looking across at the other. One can only wonder if the opulence represents ownership of the former cannery and the slum like properties those of the workers. I have absolutely no way of knowing anything about either group, and perhaps even speculating is completely inappropriate, most likely so! But as you look at the total picture you are free to make up your own story. This shot is taken from just a few feet distant from that of yesterday's offering, which I guess just supports that old adage of location, location, location. 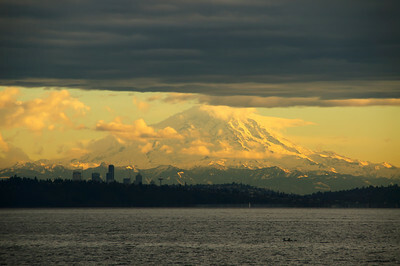 Puget Sound proper sits near the top of the image where the blue colored mountains peek out at you. ISO 200; 1/160 sec for the middle of the 5 frames that comprise this HDR image @ f /13. 11 Mar 11. Downtown LaConner, WA offers much that is pleasing to the eye, including some interesting store fronts, a lovely arching red auto bridge, plenty of aquatic based themes, and a plethora of street art. If you enjoy the art of photography, this is a delightful place in WA State to visit. You can find something to do most any time of the year but I don't recommend visiting during the weekends of the annual Skagit Tulip Festival. You could of course visit then, and there would be MUCH to photograph, but finding a place to park might take you the better part of the weekend. A slight exaggeration perhaps, but not by much. Any other time of the year parking is a breeze, and the downtown area being small will be easily and fully accessible from any parking spot. I like going there any time things aren't crowded, and that includes week days during the festival when the store fronts and the streets are beautifully decorated with tulips of every color you might imagine, well, almost any color. As colorful as are the festival weeks, so are the opportunities for photographs throughout the year of just about everything that is downtown LaConner. For example, one might pick on the pieces of sculpture found along the waterfront, of which one of my favorites is a skeleton of a salmon through which you walk to transition from street to pier. 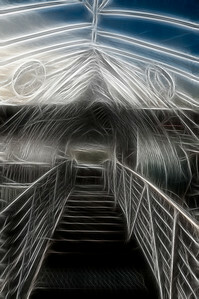 It sits atop a ramp and walking through it you get the feeling of how Jonah may have felt during his journey in the belly of a big fish. A clever and attractive piece of sculpture, I share it with you from a slightly different perspective. In this shot you are looking up towards its mouth and the eyes are directly above you. ISO 200; 1/400 sec @ f / 8. 14 Mar 11. 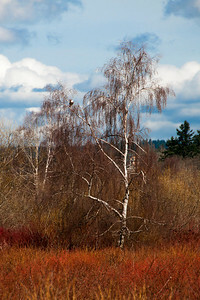 As the temps are warming up our beautiful cold and clear weather of last month is turning into lots and lots of days of depressing gray and rain, so I'm venturing back to days of the cold and clear to share another image from the trip to the Nisqually National Wildlife Refuge. As I was approaching the exit for the reserve, the moon was rapidly heading for the horizon, so I pulled off to the side of the freeway in a safe spot and grabbed a couple of images before that lovely celestial body disappeared for another day. It had been teasing me all the way down on the drive from the house to the final destination, so I just had to give it at least one try. The images I got were not quite as the mind/eye thought I saw them, so I've added a bit of contrast boost with a plug-in filter called spicify to render the image somewhat more like what I was trying to capture originally. In the process the heavily frosted grass underwent a slight blue shift which I really like as it helps me convey the experience of the cold that was present that morning. The filter also added a bit of texture which I removed from the sky but left on the ornamental grasses in the foreground as I feel it helps balance the overall image. ISO 800; 1/320 sec @ f / 7.1. 15 Mar 11. After a solid week of rain, including a torrential downpour during Sunday night/Monday morning, the ground around our humble abode became over saturated and the basement flooded again for the third time in four years. Monday evening was to be a fun camera club meeting with me providing the image critiques, but instead the evening became part of 7 hour marathon towel brigade with a constant exchange of towels between basement floor and spin cycle in the clothes washer. So, with that in mind, I said to myself, why not a water based image for today. Not of the basement obviously, something a bit more relaxing. Thus, we return again to that cold morning at the Nisqually Wildlife Refuge and take a gander (actually they departed for this photo) at the view from the northern end of the viewing platform next to the visitor center. A basically simple view, but in its simplicity lies it elegance, at least to my way of seeing. 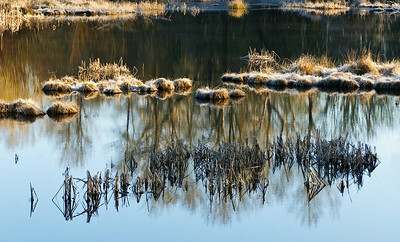 Then again, even in its simplicity, you may see a couple interesting things in addition to the frosted grasses. And no, there are no geese hiding somewhere in the image. ISO 400; 1/400 sec @ f / 7.1. 16 Mar 11. During the last couple of years there has been an increasing trend for software manufacturers to provide on-line training programs for free, demonstrating their product(s) including creative uses thereof. Called webinars, a new term for what I would suppose is short for web based seminars, they can be very helpful and I've found them, for the most part, to be worth the time I've invested. Last week a big name in the photography world suggested that we fail to get a lot of very interesting images because we don't get down and dirty when photographing our subjects. In fact, he made the statement that once one gets down and starts shooting from that perspective, that it will become that photographer's standard. Let's see if you agree. To date, all the images I've shared from the Salish Slough shoot have been taken from above the vessels either from a short bridge that goes over the water, or from a position just off the bridge. So let's now look at another shot of the same boats, actually just one of them, that I took by walking down the bank to the edge of the water and getting down on my haunches. The perspective now is that of a bit lower than deck level. Does it look significantly different, even better perhaps, as proclaimed by the pro? Or is it perhaps just another way of looking at the subject? Your call. ISO 200; 1/321 sec @ f / 13. 18 Mar11. Picking up from where we left off yesterday, I'm going to bet that everyone on this list has seen at least one movie with a major chase scene in which the hero is being pursued by an angry mob of something. Invariably it looks as though the mob is literally right on top of the hero and the worst is about to happen. This effect was well used in all the Raider's of the Lost Arc series, and also in the Mummy series of movies. Has you sitting right on the edge of your chair in excitement (unless you are a modern day teenager in which case that's where you sit anyway) 'cause you just know the hero is about to be "dun in." Of course our hero always escapes as it ultimately turns out that he had plenty of distance on his pursuers. Cheap trick, constantly used in the thrillers. You can do it any time you want by simply using a long focal length lens; anything around 300mm or longer serves just fine to create the illusion. If I were doing this in a classroom I'd use several images to show it incrementally, but since I give you only one image I'll give you the last frame, so to speak. I shared an almost identical shot late last year but with a different theme, so here is another image of Mt Rainier looking across Puget Sound. Using the 300mm focal length, I've compressed Puget Sound to something more akin to a small lake, stuck Shilshole Bay Marina, the Space Needle, the 3 major T.V. broadcast antennas, and several of the largest downtown Seattle building right in your face. And then, just to top it off, pun intended, you have the foothills and Mt Rainier of the Cascade Range appearing as though they are smack up on the eastern edge of the city. In reality, the distance from where the photo was shot and the Cascades is roughly 90 miles as the crow flies, yet it looks like you could reach out and touch them. Fun stuff with lenses and perspective manipulation. ISO 200; 1/320 sec @ f / 8. 21 Mar 11. A busy three days this past weekend with opportunities on Friday, Saturday, and Sunday, all of which proved rewarding but perhaps the biggest opportunity occurred Saturday night when, miracle of miracles, we had generally clear and rain free skies for the super moon event. No doubt you all heard about it and perhaps many of you got to witness it. With the celestial body predicted to be 30% brighter and 14% bigger than normal as it approached the earth, the closest it has been since 1993, a mere 221,656 miles away, I had to go try and grab a couple of shots. While I didn't get any publishable worthy images like those in the link above, those of us in attendance at the viewpoint on SW Admiral Way overlooking Harbor Island (very bottom of image) had a grand view of the entire show. From the moment it broke the summit of Tiger Mountain until it entered a dark cloud bank, the viewpoint area was shoulder to shoulder photographers. We watched, chatted with one another, and photographed the show for the better part of an hour, then departed for a second opportunity for another night photography shoot in a part of the city not far from where Jan and I grew up. I guess I'm glad I saw this particular moonrise but, in truth, I couldn't tell much difference between what we saw Saturday night and the other moons we've seen rise these last several years. Of course that may well have more to do with the deteriorating memory than reality. 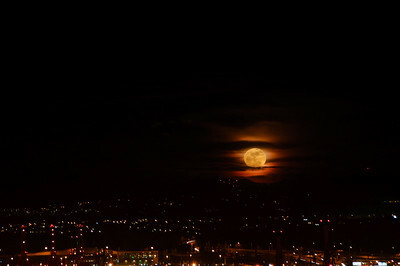 This image is obviously a composite of two, as the difference in exposure for the city and moon was 6 stops. ISO 200; 2 sec @ f / 8 (city) and 1/30 sec @ f / 8 (moon) on a tripod. 22 Mar 11. After having a go at the moon rise, we meandered over to what is now PacMed, before that the old Seattle VA Hospital, and when we were kids, the U.S. Marine Hospital on Beacon Hill. I'd never been there prior but had seen lots of night time images supposedly taken from that location and it seemed like a fine evening to go give it a try. I had no idea how to get there but my shooting partner for that evening did and so we went. It is an interesting location, and I'm not exactly sure I'd want to be there at night all by myself toting a bunch of camera gear, but the evening went well and I found myself shooting from several different sites adjacent to the campus. At one point, well down an embankment from the main road, I ventured over towards the edge of a cliff almost falling as I stepped onto some very slippery mud and then fighting with a bunch of brambles. Would have been much smarter to have turned on my flashlight; got smart fast though, and used it to find my way out of the mess. But it did offer a good perspective of the city that likely one can't get from any other place. 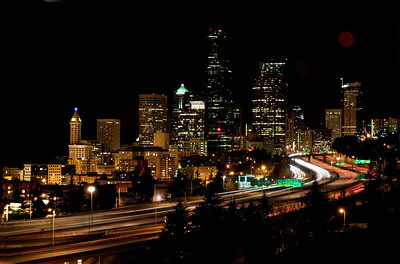 Here we are looking north along I-5 towards downtown Seattle. The blue light at the center left adorns the top of Smith Tower, the tallest building west of New York City at 522 feet when built in 1909 and by law the tallest building to be allowed in Seattle until the rules were bent 5 decades later and the Space Needle was built for the 1962 Seattle World's Fair. Of course, once one exception was made there was no going back, and today the Smith Tower gets lost in the noise of all the high rise office and apartment buildings. ISO 200; 8 sec @ f /18 on a tripod. 23 Mar 11. About 8 miles from our home in Ballard sits Meadowbrook Pond, considered by some to be the best kept secret park of all the Seattle parks. It is part of a water shed and I think it is fed by Thornton Creek, but I cannot find anything definitive on it. The area has been sculpted by artists and is a quiet refuge from the busy city although it lies barely one block off a main drag. In fact, you could drive right by it for years and never even know of its existence. A good friend introduced me to it a couple of years ago and I paid it a visit with him Tuesday afternoon to photograph whatever was there, hoping for at least a Wood Duck and a Common Merganser pair. I wasn't disappointed and got to see a bit of a show as the Wood Duck has apparently mated with a Mallard hen whom he vigorously defends against all the male Mallards. We got to watch several chase scenes and a bit more. The photo I'm sharing today took place just as the Wood Duck was chasing off a group of Mallards, both drakes and hens. It could have been a wee bit sharper, but I felt the slight softness gave a feeling of motion that isn't all that distracting and may even add a bit of realism to the image. The Wood Duck can be seen directly behind the Mallard in the very middle of the image and an American Widgeon sitting at water's edge behind the hen taking off on the left of the image. ISO 200; 1/320 sec @ f / 5.6. 24 Mar 11. While waiting for the second half of the Mountaineer's Basic Photo class to convene Sunday afternoon at the clubhouse on Magnuson Park, I drove down to where the old airstrip used to be located. It has been removed and in its place a series of ponds have been created to make an attempt at returning the area to what was fundamentally wetlands prior to the construction of the Naval Air Station after WWI. There are now a series of ponds that have been created to look very natural with a cement walkway allowing you to meander around all of them. 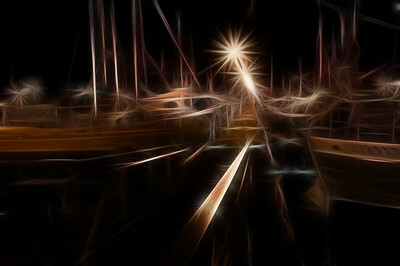 Depending of the timing of your visit, they can be bustling with life, seeming devoid of it, and everything in between. As I was walking along the path between two of the ponds, I was aware of a lot of crow activity very close to me, but they didn't seem to be all that excited by my presence. So I stood still for a few moments trying to determine the source of their activity and then suddenly I realized what was happening. 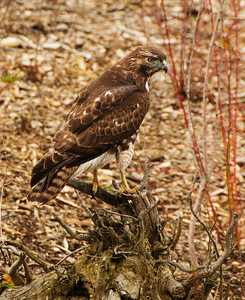 Perched on a log not 10 feet from me was a beautiful raptor quite intent on watching some of the ducks swimming a few yards away. I slowly raised the camera and began to push the shutter. After more than 10 minutes of rearranging electrons, I decided it was time to move on and let the critters do what they were intending prior to my interruption. Several of those shutter presses turned out O.K. ; this is one I particularly liked. Since the area is very busy vegetation wise, I elected to use a medium large aperture to soften the background. ISO 200; 1/400 sec @ f / 6.3. 25 Mar 11. Saturday will be the final outing for the Mountaineers Basic Photo class and once again we will meet at Fisherman's Terminal. For my taste the class convenes too late at 0700 to get the really great photos of the boat's lights reflecting off the surface of the water, so I arrive 90 minutes prior while it is still very dark, the water flat calm, the reflections great, and with time to do my own work before assisting the students. That is unless it is raining, and the weather guessers are calling for just that for Saturday morning making it doubtful that I will be able to get the material I want. Why the program Chair insists on holding the classes in March is a mystery to me as the 4 years in which I have participated have seen as least twice as many rainy days as sunny ones, but still we stand firm in our resolve. Believing that the weather will not be cooperative - I hope I'm wrong - I've picked a shot from last year with similar weather and modified it to make a hopefully interesting image although not what anyone would have seen. Nonetheless, what you are looking at should be very obvious, not nearly as obfuscated as some early Neiman paintings, which are currently selling for the tens of thousands, but still abstract enough to give you pause to see it clearly. ISO 200; 1/30 sec @ f / 22 on a tripod. 28 Mar 11. 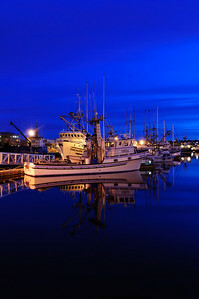 Having spent the day Friday doing a wildlife shoot in addition to swapping out grand children, we opted to skip meal preparation and journeyed the 1.5 miles to Fisherman's Terminal for a seafood dinner and a bit of pre-workshop photography. As we enjoyed the cuisine at our favorite seafood restaurant, we also took delight in watching the approaching storm and all its magnificent beauty as the clouds roiled in presenting in pure white to almost charcoal black with lots of gray shades in between. I spent more time photographing than I did eating, and was delighted by some of the images. As we returned home it was as if it would be a race to see what would happen first, our entering the house, or the rain drenching us. We beat the rain, and in fact, we were virtually rain free as it turned out, but just a couple miles to the east they got drenched for over an hour. So, when I departed on Saturday morning 90 minutes early for the workshop, I was greeted by a waxing crescent moon and a deep dark blue sky. One really couldn't ask for more and so I took the opportunity of working that 90 minutes rather hard and was well rewarded. 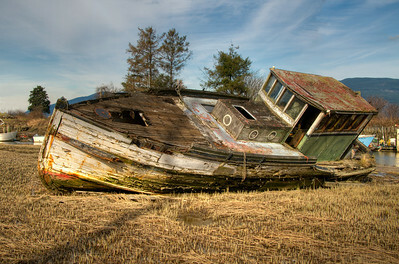 For a number of the images I elected to go with an HDR approach, and the image for today is from one of those series. As it turned out, in several of the HDR series, a single image was the perfect shot and stood very well on its own, and this is one of them. The sun is just beginning to light the sky to the right of the image and the deep dark blue is giving away to a much brighter but still solidly blue color. I altered the white balance to make the camera believe I was working in tungsten light and as a result got much purer whites than would otherwise have been recorded. A cheap trick to get around the more commonly seen yellowish color resulting from this type of lighting. It is roughly 0630, the light changing very fast, and just minutes away from the sun putting on a very brief but spectacular performance as it rose above the Cascades and into a heavy cloud cover. And then shortly thereafter it began to rain for the rest of the day! ISO 200; 8 sec @ f / 10 on a tripod. 29 Mar 11. 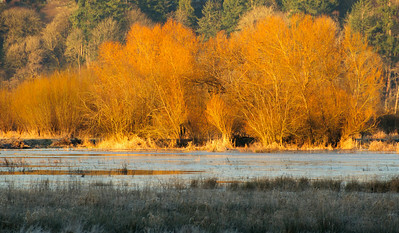 The alluded to wildlife shoot on Friday morning was done at Mercer Slough in Bellevue, WA. For the first 5 years of my 14 year employment as a barber, I passed by this area twice daily, both to and from the barber shop, but never took the time to actually visit it even though it was the site of a major ruckus in the early 70s when a developer wanted to put in a business park in the middle of it. Eventually he got to do it and it was a great success in that it damaged virtually nothing but provided a wonderful oasis for a work environment and lots of opportunity to commune with nature! After it was completed it became a model for other such efforts. Looking for something new to photograph, we elected to give it a go and see what was there. As soon as we entered the boardwalk we noticed a large raptor off in the distance and initially thought it to be a Bald Eagle. But when we got back and I had an opportunity to look more closely at an enlarged view it readily became obvious that it didn't look like any eagle I'd ever seen before. So I got out my bird books - all 1 of them - and unsuccessfully scoured the pages looking for anything that resembled this bird. So I leave it up to all you viewers to decide exactly what I shot. As for the day shoot, there was a lot more for the camera to capture, but I leave that for another mailing. ISO 200; 1/1000 sec @ f / 8. 30 Mar 11. As I've written many times prior, I grew up next door to a B&W darkroom, my bedroom door about 10 feet, if that, from the door to the darkroom. We both shared the quiet and solitude of the basement, and to this day I still feel that a house sans basement isn't a whole house. Many were the hours I shared with my father in that small, crowded (for two of us), dark, room, and to this day the smell of fixer brings back those memories. Apparently I'm not the only one who has these memories as the next version of Adobe's Lightroom will be renamed Photoshop CS6 and dedicated to just photographers. Photoshop, as we presently know it now, will be called Adobe ImageReady, and dedicated to graphics designers of all kinds. Upstart new manager at Adobe, April Fulson Yu, has stated: "We discovered that photographers long for the days of real photography with film and smelly chemicals so we wanted to reinforce that memory. We can't actually make the new Photoshop smell, but we're doing what we can to make photographers feel at home." Well now, if we are really going to bring back all that nostalgia, perhaps a big push will have to be in the arena of B&W photography. 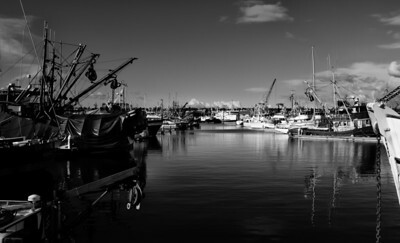 So to get a jump start on this new approach, here is a shot from the Fisherman's Terminal workshop in B&W. 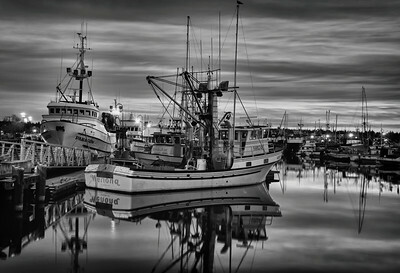 I started with three images, converted those to HDR as a mid point, and then the HDR to B&W. The seagull in the image flew to the mast top and just sat there for over 30 minutes while we snapped away. ISO 200; 2.5 sec @ f / 10 on a tripod. 31 Mar 11	Well. I must admit, I didn't know there was such a liking for B&W images with the group. Perhaps we need to resurrect Ansel. In any event, after reading all the comments, I'm sharing another B&W image for today, but this time I've come at it from a more standard approach and limited my work to a single image. In the process, it is becoming very obvious, at least to me, that B&W HDR is an area that has tremendous possibility and overlooked by just about every expert out there. I spent over 30 minutes working on this image as opposed to perhaps 5 minutes on the one for yesterday. To my eye the image shared yesterday has far greater detail and a much fuller complement of all the tones in Ansel's zone system than does the one for today. After working up this shot I did another in HDR and am pretty much convinced that I will start doing a lot more work with B&W HDR. I do believe I see a future magazine article on the topic. This was taken on Friday evening around 1900 as we watched the storm roll in. ISO 200; 1/800 sec @ f / 11.